The pillows wash well and is so comfortable, I love them. 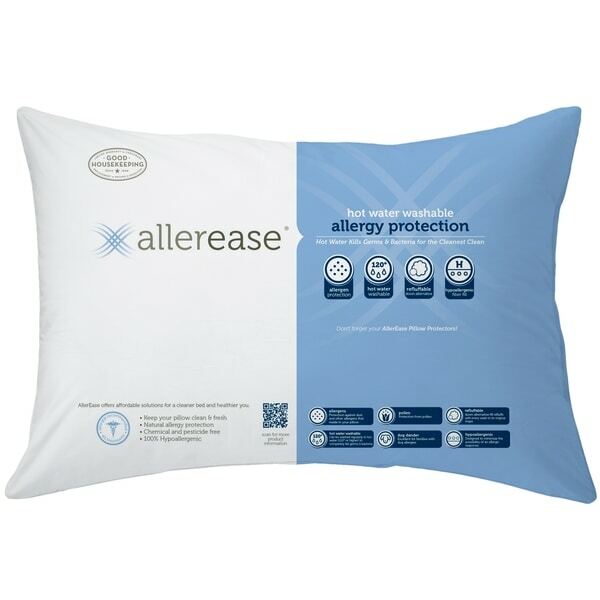 The AllerEase Hot Water Washable Allergy Protection Pillows offer comfort and support while protecting you from allergens, ensuring a more restful night of sleep. The tightly woven soft shell keeps household allergens like dust, pollen, and pet dander out of the pillow while its ability to be washed in hot water kills germs, bacteria and E.coli for maximum protection. With each wash, the down alternative fiber fill refluffs to its original shape, making the pillow look and feel fresh. I have allegies to dust mites and dust mite covers ruin the comfort and feel of a nice, soft pillow. I decided to try these pillows as an alternative to dust mite covers. Only had them long enough to wash once, but so far, very good. If you get frustrated with the stiffness from dust mite and allergen covers, these work nicely. This pillow is soft like a feather pillow. Easy to maneuver into the shape you need. Does regain its original shape. Love that I can wash them. Plastic wrapper containing both pillows states hot water WASHABLE up 120*, however manufacturer's label clearly states Do Not Wash, damp wipe only. Truly disappointed as these seemed great idea for guest room. Not sure I'll take the chance to wash them. Would have returned, but had guest coming day after delivery & no time to shop. I keep buying bed pillows for my husband , I thought I had when I gave him a really expensive feather pillows for Christmas.... I bought these for my quest room...once my husband felt them he wanted them... he is very happy with them.. He finally got the pillow that is soft yet supports.. he loves them so I do too. Nothing like a happy husband. This pillow is great for people who like scrunching their pillow, you do sink in, it does not lift your head and neck high. I'm a scruncher so I love it! Bye bye stiff neck! Hello world! I use these for houseguests and they all report how great they are. Most people are pretty fussy about their pillows and I delighted to have found these because everyone has been happy with the,. This is THE worst product I have ever purchased. The pillows have no support at all. They are as soft as a cotton ball filled with air. Just lie your head on the bed. Good quality for the price. I use tennis balls in the dryer for loft. Holding up well. The outer cover resists stains and is also soft and does not crinkle like some other allergy pillows. We are pleased with our purchase.